By closely following the contours of the rear tyre, a hugger acts as a protective shroud, preventing rain and mud from being flung from the tyre on to the rear shock/underside of the bike. Not only does it keep the bike clean it’ll also prevent stones from chipping chunks out of bodywork, alloy parts and the rear shock. A rear paddock stand helps give all-over access to the rear of the bike. 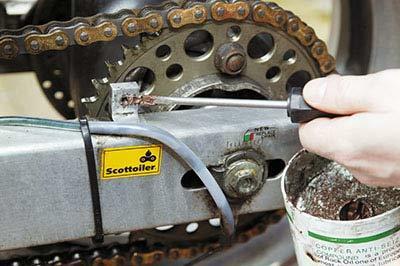 A set of Pozidrive and flat-bladed screwdrivers, or Allen keys, and even small sockets to allow removal of fasteners holding the rear chain guard, or other component brackets, in place. WD-40 or other anti-seize lubricants may be needed to free off fasteners that have stuck fast due to dirt and surface water, and copper grease to prevent them seizing again. 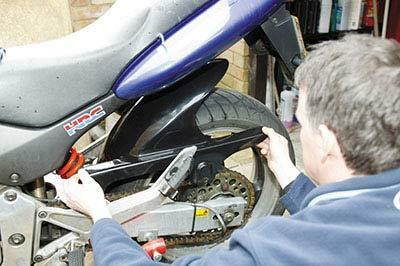 Some fit directly onto the swingarm with supplied fasteners – easy to fit. 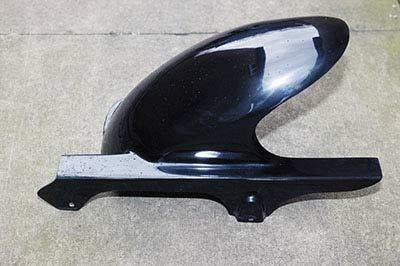 Others are made to allow the original chainguard to be retained – easy to fit but a bit naff. And there are those with their own integral chainguard, which look good but take a little longer to fit. Carbon, glass fibre or plastic huggers all do the same job, at different prices. If you can correctly install batteries in a TV remote first time then there’s no reason why you couldn’t or shouldn’t fit a hugger on your own. 1. Check all of the parts needed, like brackets, spacers and fasteners, are included as per the instructions and parts list. And while you’re at it check the box to make sure it’s labelled as the right hugger for your bike. As with anything ordered via the web or by phone, always quote the bike’s year of manufacture or model designation code. 2. 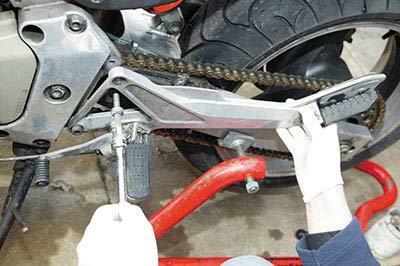 If the bike isn’t brand new and the chainguard has to be removed then soak the retaining bolts/screws with anti-seize spray and leave for a while before attempting to undo them. Always use the correct sized screwdriver or socket to undo the fasteners – chewed fasteners are as big a problem to remove as bolts that have sheared off. 3. 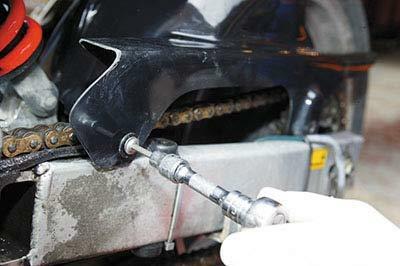 If footrest hangers have to be removed to access the chainguard’s mounting bolts/screws, an extension bar might be needed to ‘crack’ the bolts undone – a non-setting glue (Loctite) is used on the threads. If it’s the first time they’ve been undone you won’t need to apply more Loctite to the threads when refitting the bolts. 4. Take the hugger and carefully put it in place. Check the mounting brackets and mounting holes on the hugger fall roughly in line. What you’re doing is checking that the hugger will actually fit your model of bike. Marked or damaged parts may lessen the chances of an exchange for the correct part even if you’re sure you ordered correctly. 5. Remove the hugger and fit any rubber spacers supplied. 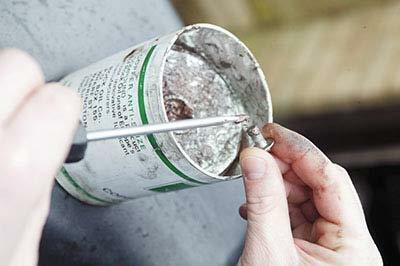 Apply copper grease to the start of the threads on all fasteners – as you wind the bolt/screw in, the grease is worked back up for total coverage without using too much in the first place. Old corroded bolts should be wire-brushed clean beforehand. 6. A good tip is to apply copper grease to the threads of any mounting points/brackets – use a small flat-bladed screwdriver for ease. As the bolt/screw is wound in the threads are also covered with the anti-seize grease. 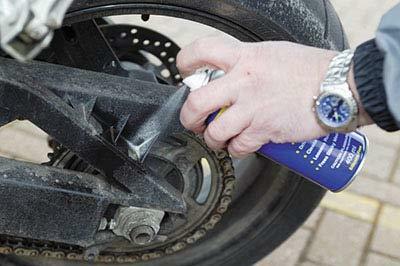 The grease also forms an effective plug against dirt and water ingress into the threads. Make sure you wipe off any excess, though. 8. Instead mark the hugger with a pencil where the hole should fall and then remove it. If the hole is a mile off, drill a new hole – start with a 3mm pilot hole first and put tape on the hugger to stop the drill from sliding and scratching the hugger. Otherwise a rat tail file can be used to extend the hole in the direction it needs to go. 9. Refit the hugger and tighten the bolts up. Check the hugger is perfectly aligned – an equal gap across the breadth of the tyre, and the middle of the hugger aligned with the middle of the tyre. 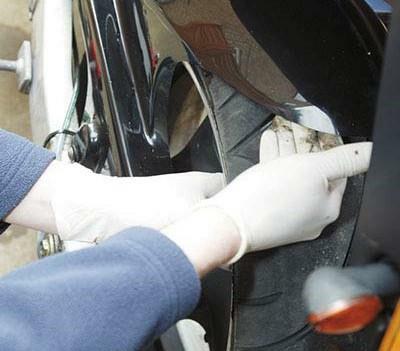 It should not foul any part of the tyre, chain, exhaust or underside of the tail section – check by going two-up while stationary to compress the rear end. 10. 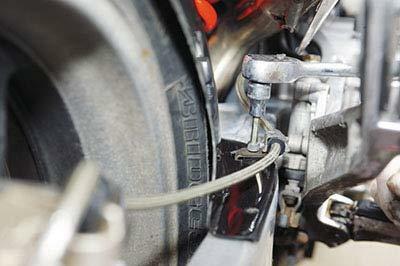 Check the routing and clamping of the brake line hoses and, in some cases, the rear wheel speed sensor. Make sure the hose clamps don’t interfere with the hugger or they’ll cause it to crack when tightened in place. 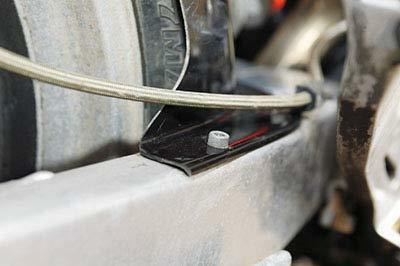 If the hugger is lop-sided then small washers on the screws/bolts, under the hugger, will square it up. 11. A recommended tip is to fit self-adhesive draught excluder (sponge strip) to the area of the hugger where it sits flush on the swingarm. 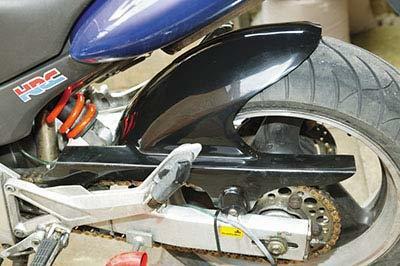 The reasons are that it provides a perfect seal to stop surface water and grit getting onto the rear shock, it also stops any possibility of the hugger rubbing or vibrating against that costly swingarm. 12. Huggers not only prevent damage from flung road crud but can add that desired factory finish look. Always bear in mind that glass fibre huggers aren’t as resilient to damage from flung stones as, say, carbon-fibre ones. 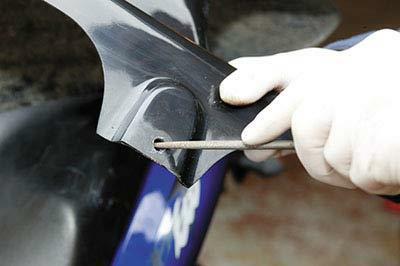 Clean the hugger in the same way as you would the bodywork – carefully and with pride – because you fitted it. R&G Racing has added to its Yamaha Fazer8 and FZ8 range with a new hugger and chain guard.